KATHMANDU, June 20: Experts said Monday that the five month long blockade not only fueled the black economy and corruption but also institutionalized them. Speaking at an interaction on ‘Post Disaster Assessment: Blockade 2015/16’ organized jointly by Nepal Economic Forum (NEF) and Alliance for Social Dialogue in Kathmandu on Monday, they also said that the society has accepted black economy and corruption as the government was seen to support the black market activities during the period. Journalists and political commentator Chandrakishore Jha, who is based in Birgunj, pointed that protection provided by the state to key players of the black market was a reason for the uncontrolled flourishing of the black market. He said the state had been Kathmandu-centric and indifferent to the concerns of the bordering areas, which were exemplified by the fact that during the blockade, getting supplies to Kathmandu was viewed as the priority, ignoring the people along the border towns who were also suffering as a result of the supply shock. On the social front, he said social relations should be viewed as a key capital in the economy but dissatisfaction in the Tarai-Madhes, which gave rise to the blockade as a by-product, has heightened the discord in social relations. Likewise, Janakpur-based social researcher and political commentator Surendra Labh said the social acceptance of the black economy exposed the society to dangers of that becoming the dominant norm. He talked about how corrupt attitude is celebrated in our society and our socialization process congratulates people geared toward materialism. Labh also talked about how different categories of people perceived the blockade differently and how it was important to view the blockade as a by-product of the discord brewing in the Tarai-Madhes. On the occasion, Mallika Shakya, NEF advisory board-member and professor at the South Asian University, talked about the importance of understanding the difference in perception of the blockade from the capital and the border towns. In the context of the blockade and the black market that emerged during this period, she noted that the corrupt elite had captured and adapted the informal economy’s ways of operation to extract financial gains out of crisis situations. She also stressed on the need to view the blockade ordeal through the lenses of ‘South Asian-ness’. For more than a year now, the Nepali economy has been gasping for breath as multiple challenges choked the country one after the other. The devastating earthquakes of 2015 claimed close to 9,000 lives and injured more than 22,000 inflicted enormous costs -- estimated at $7 billion -- on the economy and is expected to push close to 700,000 people below the poverty line. Just months later, constitution-related protests in the Tarai region which culminated with the border blockade came as another major shock to the economy and the society at large. As the trade blockade continued, with vital supplies to the landlocked country virtually cut-off, the resultant energy crisis made its impact felt across all sectors of the economy. On one hand, essential imports like medicines and fuel was not allowed to enter the country, and on the other hand, the crippling shortage of fuel adversely affected production, distribution, and consumption processes of the economy. On the occasion, Rabindra Adhikari, the chairman of the Parliamentary Development Committee, stressed the importance of trade and transit diversification. He said the country cannot be truly sovereign till the day it diversifies trade and transit and moves away from excessive dependence on a single trading partner for essential commodities. Sharing his experiences of travelling across the postal highway in the Tarai, he identified it as a lifeline for national integration, highlighting that infrastructural connectivity should play a key role for integrating different geographic regions and thereby promoting overall national integration. The key themes that emerged during the course of the discussions revolved around the need for social transformation in order to prevent corrupt attitudes becoming the new normal, moving toward a self-reliant economy through diversification of trade and transit, and demanding accountability from the government. 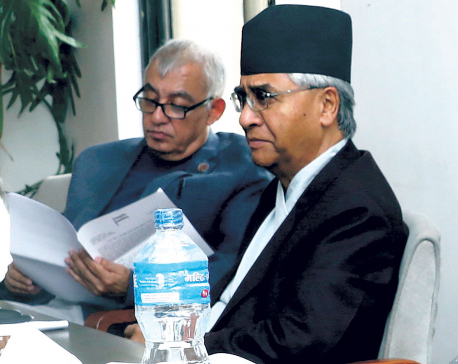 The longer term implications of the blockade could are much more complex and adverse, the speakers said, brainstorming in an attempt to trace the blockade’s ramifications and provide a fresh pair of lenses to the discourse.